Where Will the Lakers Strike on the Trade Market? Bradley Beal, Kemba Walker and Nikola Vucevic are major names the Lakers could target prior to the trade deadline. The Lakers weathered an early storm to sit at 15–9 on the season following a victory over the Spurs on Wednesday night, good for fifth in the West. LeBron and Los Angeles’ cast of youngsters and misfits are just two games back of the conference’s top seed, and have displayed stronger cohesion early in the year than previously expected. Year one of the LeBron era has been generally smooth sailing thus far. Yet for all the encouraging signs surrounding the Staples Center, it’s hard to shake the notion of a limited ceiling for James’s new crew. A postseason appearance is likely, but just how lowered are James’s expectations? It’s hard to imagine the baby Lakers claiming consecutive playoff series, let alone challenging the Warriors. And if Los Angeles slides down the standings in the coming months, will James’s patience hold firm? That hasn’t been the case over the last four seasons. Los Angeles is in prime position to attack the trade market if it seeks to make roster improvements for 2018-19. The Lakers boast a quartet of intriguing young prospects as well as six expiring contracts. Players signed this offseason will be eligible for trade on Dec. 15, opening the door for Lance Stephenson, Michael Beasley, Rajon Rondo and Kentavious Caldwell-Pope to be dealt within the coming weeks. The Lakers’ slew of one-year deals this offseason served to clear cap space in July, but also added quality cap filler in potential trades. Two years of $12 million for Caldwell-Pope is a tough pill to swallow. Absorbing KCP’s contract as an expiring, however, can likely net a draft pick or a young building block. So who might the Lakers pursue on the trade market before the February trade deadline? Here are five potential candidates. 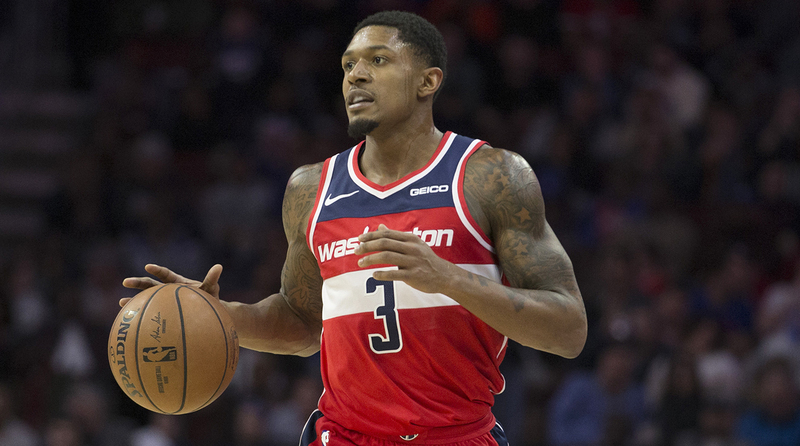 Beal is the most valuable of Washington’s three big-money contracts, and Washington likely prefers dealing John Wall or Otto Porter before Beal. Wall’s contract ($188 million through 2022-23) could be untradeable, though, while Porter’s value is questionable. He’s an effective third option and just 25. But could over $25 million over the next three seasons cause hesitation from prospective buyers? With the 2019 free-agent frenzy approaching, tying one’s cap to Porter seems like a foolish play for big market team like the Lakers. A team like Sacramento makes more sense. Beal, on the other hand, is worth the absorbed cap space. The Florida product is a malleable second option, thriving in the nation’s capital despite largely playing off the ball. Beal is a career 38.9% three-point shooter and proven playoff performer, unlikely to shrink from postseason biggest. He’s improved his game off the bounce and in transition, and can take hold of an offense when James heads to the bench for a breather. Los Angeles waited on Paul George and Kawhi Leonard in free agency, opting to withhold its young pieces from the trade market. If the Lakers don’t want to run the risk of getting spurned again, acquiring Beal with two years left on his deal after 2018-19 is a smart bet. What would a potential Beal trade look like? A Lonzo Ball-John Wall backcourt would be ill-fitting, and the combination of Kyle Kuzma and Josh Hart probably won’t entice Washington to pull the trigger. A player of Beal’s quality will likely require Los Angeles to part with Brandon Ingram. A Beal for Ingram swap would have been turned down by the Lakers three months ago. But Ingram’s fit with James has been shaky thus far. The pair sport an offensive rating of just 104.2 in 494 minutes together, a mark that would rank No. 28 in the NBA. The Duke product projects as a high-usage forward moving forward. That won’t fly with James at the helm. Ingram’s upside should tantalize Washington. Add in Caldwell-Pope and salary filler, and the Ingram for Beal swap could set both franchises on a cleaner path in 2019 and beyond. Ariza will be one of the most sought after expiring contracts on the trade market, and Phoenix would be smart to deal the 15-year veteran for draft picks or young assets. The Suns are full-steam ahead to a ninth-straight lottery appearance. They’ll continue to embrace the tank as the trade deadline approaches. The former Laker would be a snug fit in a second go-round in Los Angeles. Save for his ghastly 0-12 effort in Game 7 of the West Finals last season, Ariza was an impactful two-way threat in Houston’s chase for the conference crown, stretchy and switchable defensively with a reliable corner three. He’d align well with the specialist-filled lineups James thrived in with Cleveland. Ariza also has a championship pedigree, serving as an integral cog in Los Angeles’ 2009 Finals victory over Orlando. The Lakers won’t deal Ball, Kuzma or Ingram for Ariza. Josh Hart should be withheld from an Ariza deal, too. Los Angeles does have its 2019 first-round pick, though, and if James sees the Finals in play, the Lakers would likely deal the pick for an impactful veteran like Ariza. Walker in Purple and Gold feels like a match made in hoops heaven. He’s is a top-flight shotmaker, and a crunch-time assassin dating back to his days at UConn. It’s not hard to imagine Walker as Kyrie Irving lite, canning step-back triples as the shot clock winds down late in games. Los Angeles has no second option to James in crunch time as presently constructed. Walker would solve that issue immediately. The lifetime Hornet (and Bobcat) has spoken to his love for Charlotte in recent months, calming the trade rumors for now. But will frustration grow as the calendar turns to 2019? The Hornets are 11–13, sporting a talent deficiency even in the weakened East. Does Walker want to spend his prime years on a roster ill-equipped to compete? Maybe so, but if the two-time All-Star grows restless, Los Angeles’ haul could trump opposing offers. Boston’s has no reason to spend its war chest on Walker—likely saving up for the Anthony Davis sweepstakes—and Philadelphia spent a pair of assets on Jimmy Butler. Ingram and salary filler could work here, although a point-guard swap involving Ball may make more sense. Would the Lakers bite and add Kuzma or Hart as well? It may be a difficult pill to swallow, but acquiring a player of Walker’s pedigree is likely worth pulling the trigger. Ellington is a classic spot-up wing next to James, a three-point specialist in the mold of Mike Miller, James Jones and J.R. Smith. He’s a career 38.1% shooter from beyond the arc and a capable defender, an upgrade from the turnover-filled dribble fest of Stephenson. Much was made this offseason about surrounding LeBron with playmakers rather than shooters, though it feels like Los Angeles swung too far from James’s usual supporting cast. LeBron will likely crave a catch-and-shoot specialist come playoff time. Salary matching shouldn’t be a problem with Ellington’s slim $6 million expiring contract. Stephenson could be on the move, as could Beasley. The most difficult aspect of a deal might be trading with Pat Riley, although the icy feelings over James’s 2014 departure should have subsided by now. The Heat are without their 2021 first rounder. Adding a Lakers’ first or a pair of future seconds should improve what looks to be a murky future in Miami. The Lakers seemed to solve their center problem with the addition of Tyson Chandler in November, but Los Angeles could benefit from some stretch at the position. Chandler and JaVale McGee are a touch redundant, and while James is accustomed to dealing with a prototypical screen-and-dive center, Cleveland’s five-out lineups with Channing Frye produced some of the best offensive basketball of James’s career. Vucevic is fourth among centers in made triples with 31 in 25 games, shooting a clean 41.3% beyond the arc. He’s expanded his range in the past two seasons after previously serving as a low-post big, shooting career-highs from three and outside 15 feet this season. Don’t mistake the Swiss center for simply a shooter, though. Vucevic has been wrecking opposing defenses this season, recently torching Los Angeles for 36 points and 13 boards on Nov. 17. He’s joined by Karl-Anthony Towns as the only players to average 20 points and 10 boards while shooting 40 percent from three. Vucevic is nearing the top class of offensive fives. What was previously an intriguing expiring is now a sought-after playoff piece. Swapping a member of Los Angeles’ core for Vucevic would be short-sighted, but draft capital may get the job done. The Magic’s lack of passable point guards could make Rondo a valuable commodity in Orlando as well. Perhaps Rondo and a 2019 first rounder gets a deal done.